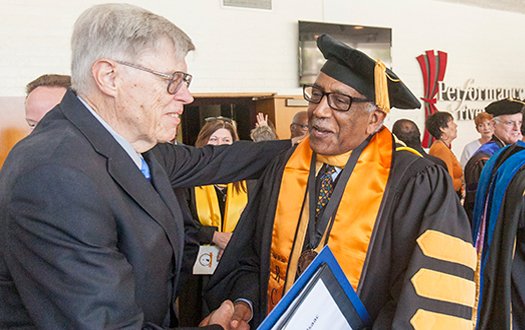 Celebrate: RCC’s new president, Wolde-Ab Isaac, shakes the hand of Irving Hendricks former RCCD interim chancellor, at the Presidential Investiture held in Landis Auditorium on Oct. 12. “On such a historical day of celebration I am proud, honored and humbled to be installed as the 11th president of this great institution,” Isaac said. One of the oldest traditions in academia, the Investiture Ceremony honoring the inauguration of President Isaac, took place Oct. 12 from 9-10:30 a.m. in the Landis Auditorium. The ceremony commenced with a performance by the RCC Wind Ensemble, led by conductor Kevin A. Mayse. The lighting of the Lamp of Learning by Ryan Rudolph, student trustee followed. Rakhee Uma, vice president of the associated students of RCC led attendees in the pledge of allegiance. Among those in attendance, were Mayor Rusty Bailey, Riverside Community College District Chancellor Michael L. Burke and RCCD Board of Trustees President Virginia Blumenthal. Family members, including the president’s three sons Zeru, Simon and Yisak and his youngest sister Mehret, sat in the front row at the ceremony. Longtime friend and comrade, former Ambassador of the state of Eritrea to the Russian Federation H.E. Teclai Minnadie, traveled from Europe for the occasion. Students were curious, enthusiastic and in good spirits about the ceremony. “I’m excited, I can’t wait and seeing everyone dressed up in their regalia is really intimidating,” said a smiling David Huxley, RCC student and Interclub Council representative. One student was encouraged by her politics instructor to attend the event. Introductions were led by Virginia McKee-Leone, acting vice president of Academic Affairs. Speakers positively reflected upon their hopes for RCC’s future now that Isaac is president. Once more, Isaac’s trademark commitment to the students was recognized. One speaker reminisced about writing and working on several unique grants over a decade and a half ago. The grants involved faculty collaboration, curriculum development and technology transfer with the University of Asmara in Eritrea, East Africa,where Isaac served as president. Dariush Haghighat, president of the faculty association for RCCD,shared his relief upon hearing the news of Isaac’s application for vice presidency. Haghighat was vacationing halfway around the world when he received the phone call from one of his colleagues. Isaac is not only praised by his colleagues for his incredible academic achievements, but also for his strength of character. Virginia Blumenthal, president of the RCCD Board of Trustees quoted British historian and politician Thomas Babington Macaulay. Keynote speaker, Salvatore G. Rotella, chancellor emeritus, spoke of Isaac with high academic esteem and as a dear friend. He touched on the instability of the presidency. In 2004 to take on the newly created post of chancellor of the system, Rotella left the role of RCC president. “There were seven presidents in 84 years and 6 in the last ten,” Rotella said. Rotella grew up in Eritrea, Africa where Isaac was born and raised. “Dedication to family and a passion for education have distinguished Dr. Wolde-Ab since early in his life,” Rotella said. Isaac was the oldest of seven siblings and made sure that each one of them got an education. Following Rotella’s speech, Blumenthal and Burke officially inaugurated Isaac by adorning him with a ceremonial sash. Isaac shared his gratitude and told attendees about his journey to presidency. Isaac’s father completed the first three years of elementary education while his mother never attended school. He was not only the first born of his siblings, but also the first in his family to go to college. Although the family struggled economically, he said his parents provided immeasurable love and support to him. “The primary drivers were my parents and my teachers who believed in me and encouraged me to go on to the next level,” Isaac said. He shared how his parents would be proud of him. His father is deceased and his mother is 91 years old, therefore age and distance prevented her from attending. Isaac discussed his involvement in rebuilding the university of his homeland of Eritrea, Africa in 1993, after the catastrophic war had ended and left it in ashes. “In a world where we are deafened by news of war, famine, terrorism and drugs it’s easy to forget that we are surrounded by great people of good will who are ready to help us empower and transform people through education,” Isaac said. He believes his gigantic endeavor will succeed because “We have the people of conviction who are determined to bring change to the community,” Isaac said. A performance by the RCC Chamber Singers, led by conductor John Byun, followed the presidential address. All guests stood while the chamber singers led the singing of RCC’s alma mater. The RCC Wind Ensemble concluded the ceremony with a final performance. A reception took place in the Landis Foyer featuring music by the RCC Jazz Combo, while guests welcomed and congratulated RCC’s new president. Among the crowd of smiling guests at the reception was Isaac’s son, Simon Isaac,who is following his father’s lead by choosing to major in chemistry at University of California Riverside.